There are many key numbers you should be tracking in your business every day, week, month and year. 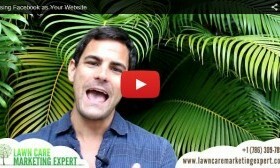 Today we talk about just 3 key numbers related to lawn care marketing. There are many other numbers lawn care business owners should be tracking on a monthly, weekly, daily basis but those are the key ones related to marketing. • This includes your customer acquisition cost. How much does it cost to acquire a new client via different marketing methods you are implementing? • How much is a new client spending? • If you are acquiring new clients worth $7000 over 2 or 3 years spending $50-$100+ per client in time and advertising costs is a no brainer. In fact, it’s a 70X return on your investment. • When you monitor this, you can reinvest more in the marketing strategies with the highest return on investment. Close rate – percentage of leads closed? • Why aren’t they closing? • You might need to Learn to sell. • You probably have a marketing, branding image problem. • You don’t look like your worth what you want to be paid. • Raise prices or fire low profit clients and refer them to someone else. • Geographic pockets of these high profit clients? Goal: dominate those neighborhoods. • 10% average profit margin across the board means you are on the verge of going out of business if any problems occur.